As the iPhone 5 unveil date approaches, here's a look at just how critical the iPhone is to Apple's success. With the unveiling of the iPhone 5 expected to come Sept. 12, we were wondering: Just how big is the iPhone? On its own, Apple's iPhone business would be a Fortune 50 company. 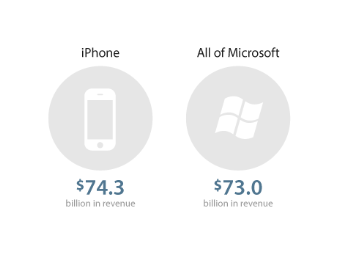 It's also bigger than all of Microsoft (MSFT). Not just Windows or Office -- the iPhone generated more sales than the entirety of Microsoft's product lineup over the past four quarters. Microsoft famously got kicked to the curb in the smartphone race by Apple (AAPL) and subsequently Google (GOOG). It's been forced to play catchup ever since ... so far unsuccessfully. Had Microsoft played its cards better five years ago, would it have been twice the size it is today? And would Apple be half as big? That seems unlikely, but what's clear is that the iPhone is the most business-crucial product Apple has ever released.